In August 2016, The San Antonio Life Science Institute (SALSI) selected UT Health San Antonio’s Postdoctoral Research Fellows, Dr. Stephanie Perez and Dr. Jorge Azpurua recipients of the 2016 SALSI Postdoctoral Scholar Program. The program provides support for two years of full time postdoctoral training including salary and benefits to the recipient. Dr. Perez received her B.S. and M.S. in Biology from The University of Texas San Antonio and a Ph.D. in Neuroscience from The University of Texas Health Science Center San Antonio. She is working with Principal Investigator, Dr. Daniel Lodge, Associate Professor of Pharmacology, UT Health. Her team focus is on Schizophrenia. “Schizophrenia is a debilitating mental illness and current available therapies are often ineffective or cause severe side effects. I am interested in learning how different brain circuits contribute to the various symptoms and ultimately finding the root cause of the disease,” said Perez. This project will help provide a better understanding of the contributions of specific cell types that are implicated in schizophrenia. In doing so, we can identify novel targets for the treatment of schizophrenia,” expressed Dr. Perez. Dr. Azpurua received his B.A. in Molecular Genetics, M.S. in biology and Ph.D. in Biology from The University of Rochester. 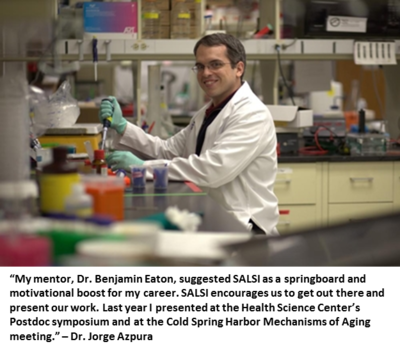 He is working with Principal Investigator, Dr. Benjamin Eaton, Associate Professor of Cellular and Integrative Physiology, UT Health San Antonio. “We’re very interested in links between some of the genes we’ve found in our work, and the pathology of Amyotropic Lateral Sclerosis (ALS), a motor neuron disorder also known as Lou Gehrig’s disease. It’s possible some of our work will clarify the underlying molecular mechanisms in motor neuron disorders,” said Dr. Azpurua. “Our research requires the use of many different techniques and approaches. It would have been impossible for me to master all the technologies we are using. Having collaborators and colleagues that helped me with bioinformatics and electrophysiology was absolutely critical,” added Dr. Azpurua.